March 20, 2017 · Uncategorized · Comments Off on TODAYS THE DAY! It’s our GRAND RE-OPENING! Get your Naked Dogs for $.94 and your Patsy Dogs for $1.75!!! 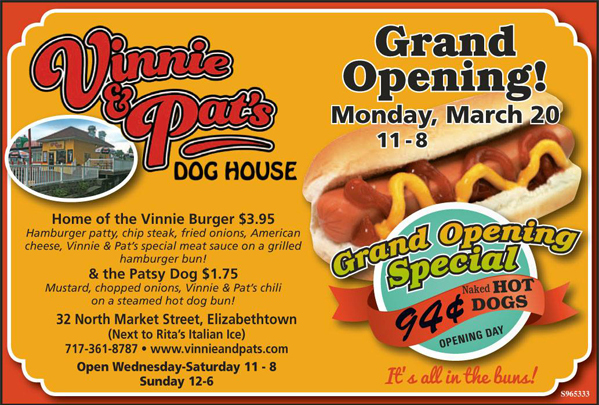 We got great deals and great foods so make sure to come on out and try our hot dogs and not dogs! Did we mention that our neighbors at Rita’s are giving out free ice for the first day of spring? Lunch and dessert on the First Day of Spring! See you soon at the dog house! ©2017 All Rights Reserved. Developed by Baked Goods Creative.